I accidentally fell in love with a super expensive swimsuit. It's the Port Stripe Halter Bra swimsuit from Juicy Couture, and I think it is the perfect nautical fashion statement. It has the classic nautical stripes, a cute little anchor on the front, and the ties in the back are made of white rope. Isn't it so fun? I'm loving all things nautical lately, though, so I'm not pulling out my wallet for that swimsuit yet. To be clear, I'm loving fashion's whimsical take on the nautical theme, which is different from the industrial feel of actually living full time on a ship like I do. While it's an adventure, the real ship life is not nearly as adorable; my uniform onboard is a bright blue polyester track suit. Ugh. 1. I love the red rope detail on these Valentino nautical ballet flats. 2. The sparkles on this nautical sequin anchor tank from Delia's stand out in a very good way. 3. This "life ring" from Asprey London is classy and cheeky at the same time. 4. The fit and flare shape of Kate Spade's Mariella dress looks chic with a navy nautical stripe. 5. I can't get enough of the watercolor details on the Candace Carryall by Coach. 6. These bright red anchor earrings from River Island prove that the cutesy nautical vibe can also be affordable. 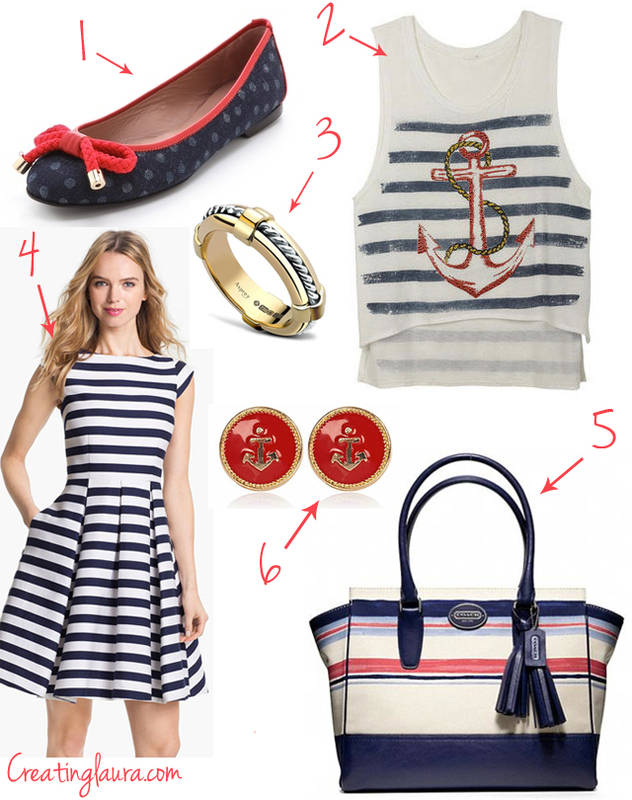 Do you love nautical fashion as much as I do?